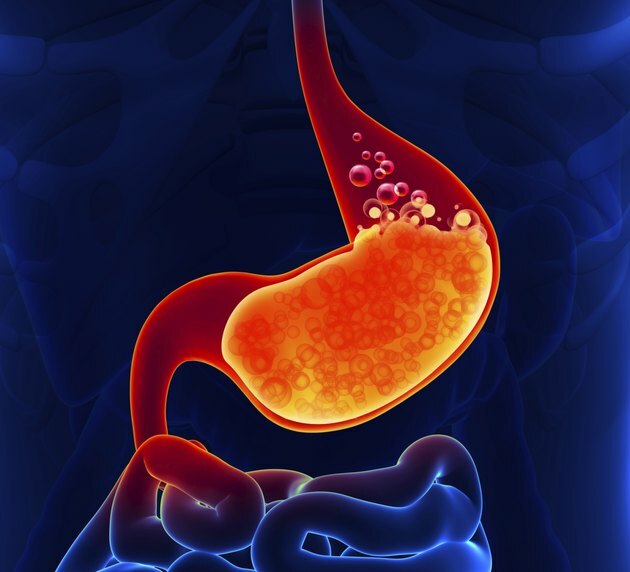 The prescription medication lansoprazole is used to treat gastroesophageal reflux disease, or GERD. The condition is characterized by the backward flow of stomach acid and food into the esophagus, causing burning pain, coughing, choking and other potentially serious symptoms. Lansoprazole is known as a proton pump inhibitor, or PPI. It is used to control the production of acids in the stomach and to help the esophagus heal to prevent and treat stomach ulcers caused by the H. pylori bacteria. There is also a milder form of lansoprazole that is sold over the counter for the treatment of heartburn. Drinking alcohol while taking this medicine is not advised. Prescription lansoprazole comes in an oral tablet and a delayed-release capsule. The nonprescription version of the drug is available as a delayed-release capsule. The prescription version is generally taken once a day to control GERD symptoms, and two or three times daily to destroy the H. pylori bacteria. The nonprescription version is taken once a day for a two-week period only. Because lansoprazole consists of a proton pump inhibitor and a nonsteroidal anti-inflammatory drug, or NSAID, it is also used to relieve pain and inflammation in cases of arthritis and ankylosing spoondylitis, as well as for gastric disturbances accompanied by pain. It is unclear how NSAIDs reduce pain and inflammation, but it is known that they can cause severe gastrointestinal problems leading to the formation of an ulcer. Only use lansoprazole under the supervision of your doctor. Alcohol can irritate the lining of the stomach and cause excess production of acid. This may lead to ulcers and gastritis, and it can also aggravate GERD. In addition, alcohol can cause clumping of red blood cells, which may clog blood vessels, leading to bleeding, hemorrhaging and possibly to death. Although drinking alcohol is not contraindicated when using lansoprazole, caution is advised. Side effects from taking lansoprazole include drowsiness and dizziness, which may be aggravated by NSAIDs. These medications may cause stomach ulcers and bleeding, which might be exacerbated by the consumption of alcohol. Certain medical conditions may be made worse if you drink alcohol while taking lansoprazole. If you have an alcohol problem, are suffering from dehydration, or have low blood sodium levels, your doctor may advise you to avoid drinking alcohol while taking this medication.